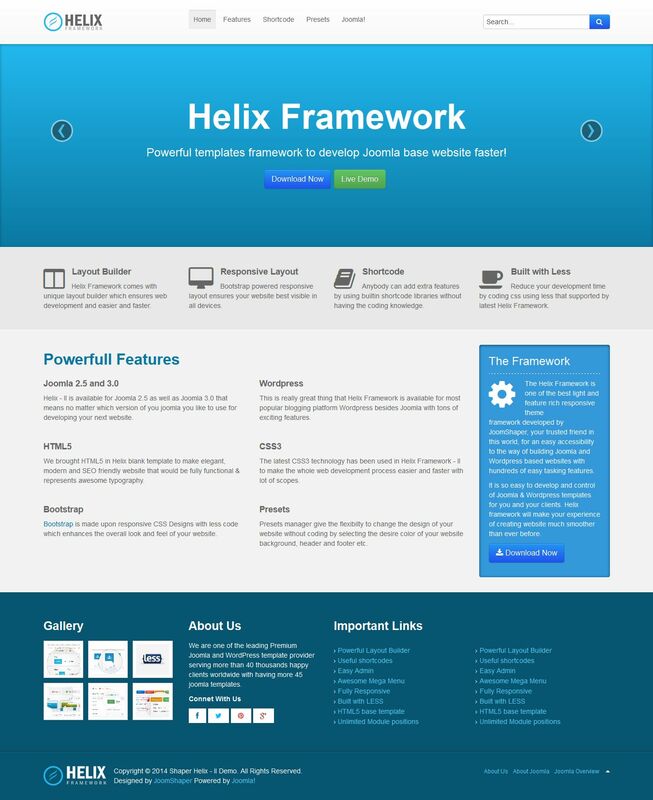 Free template from joomshaper - Helix-II. Template Helix-II operates using Framework Helix. This framework allows you to: easily add or remove the desired position you modules. And in the end is to get the number of positions for the individual modules. Responsive Layout (adaptive pattern) - Template perfectly adapts to the width of the user's browser window. This means that when you use it you do not need to use other components or templates for site adaptation for mobile ustroystva.Vstroennoe horizontal Mega Menu - no need to search and customize your design third-party modules Mega Menu. But it is worth noting that the user visit your site from a mobile device, and the delights of Mega Menu dop.moduli in it are not available. So, as the system is triggered adaptation under the CCP and the user sees a single button. When pressed, which displays a list of items menyu.V Helix-II template, you can choose one of three colors style. Helix-II also supports HTML5 + CSS3 and the ability to use this template in the environment of RTL (right to left) languages.